FINGERSPELLING - SignOn - Connect. Practice. Retain. 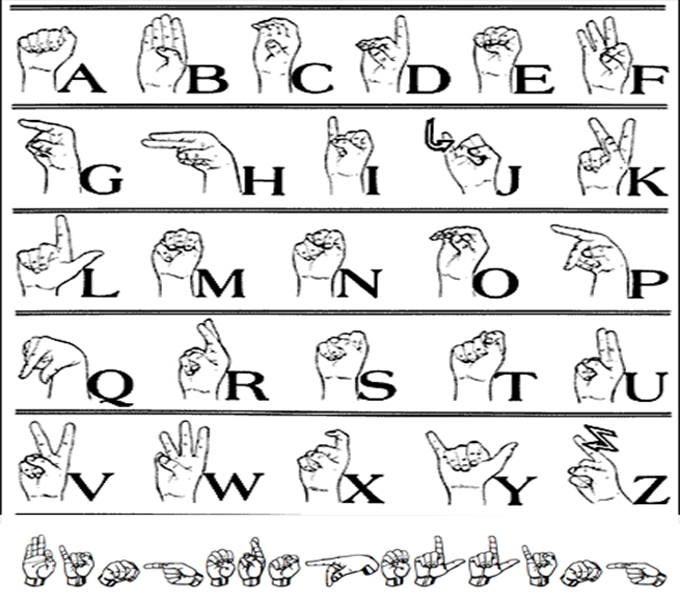 For many people, their first introduction to and learning about ASL is the fingerspelling alphabet. I GO BOSTON, B-O-S-T-O-N, ONE WEEK STAY. I VISIT H-A-R-R-Y, (shows sign name), HE WORK WHAT? B-O-T-A-N-I-S-T, PLANT STUDY. WE RIDE C-A-R SHOW-ME AROUND BOSTON. Stick with your dominant hand while FS, don’t switch hands in the middle of spelling something. For instance, if you’re right handed, stick with that hand for all FS. Unlearn the hand placement you learned off of ABC placards, books, posters and such. These pictures are taken for best viewing – many letters are shown “sideways” to see them better, but in actual signing they almost all stay palm out. Palm is facing outwards for all letters except for “G” & “H”. If it feels uncomfortable to make that letter – you’re probably doing it wrong. For example, trying to twist your wrist around to make a “G” palm outwards. Don’t worry about catching EVERY letter in a word – catch the first letter, any double letters or “special” differences in the middle, and the last letter and the context of the sentence. For example, “My friend name J-N-N-F-R” – it’s pretty safe to assume its Jennifer. After a while you will start recognizing shapes of words instead of the FS. This is how babies and young children understand FS without knowing their A-B-Cs. They learn that the hand movements that make N-O-S-E means nose. But, overall, relax about fingerspelling, with practice and exposure it will become as natural as signing.